Spring is in the air in most parts of the Western hemisphere, and the latest release from Masque Milano embodies its essence quite well. 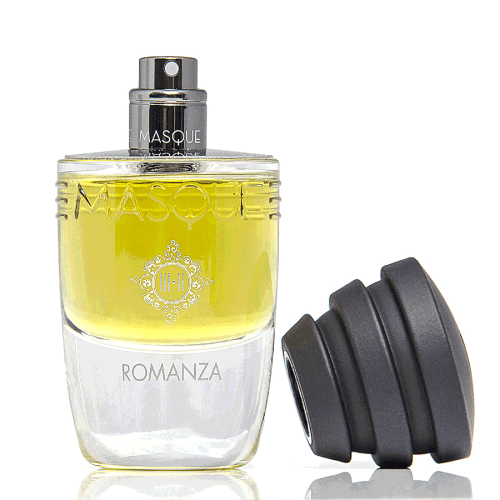 Romanza is a new fragrance that departs from the style of many of the Masque fragrances that I’ve tried thus far, focusing almost entirely on florals this time around. Despite being inspired by Oscar Wilde, the Victorians, Dorian Grey, and romantic dandies, it evoked something else entirely for me for most of its lifetime on my skin: a spring day in the countryside. It’s a largely unisex composition that I suspect will become one of the more popular fragrances in Masque’s collection. Masque Romanza. Photo source: Essenza Nobile. Romanza is an eau de parfum that was created by Cristiano Canali. It officially debuted at the Pitti show in October 2015, but its world-wide release seems to have been postponed until April of this year. One reason why might be Masque’s change in packaging; unlike the others in the line and unlike the way that I think Romanza was originally shown at Pitti last year, it will now be released in a clear, glass 35 ml bottle instead of the more usual patterned, gold and black 100 ml one. The inspiration for Romanza seems to be the myth of Narcissus as seen through the lens of Victorian romanticism and 19th century artists. While number of sites discuss or quote copy that is almost entirely about Oscar Wilde and Dorian Grey, Masque’s own website has a slightly different account, but the general narrative is largely the same: a 19th century romantic and artistic twist on Narcissus. That is undoubtedly why a major part of the fragrance is the actual narcissus flower. In addition, Romanza includes also artemisia (aka wormwood), the basis for Absinthe, a potent, allegedly hallucinogenic liquor that was nicknamed “The Green Fairy” and that was beloved by 19th century bohemians and artists, particularly Oscar Wilde. As the wormwood link explains, the legends surrounding absinthe and its effects were such that the liquor was banned for more than 70 years in many parts of the world, but it was a quintessential part of the 19th century’s artistic culture in Europe.